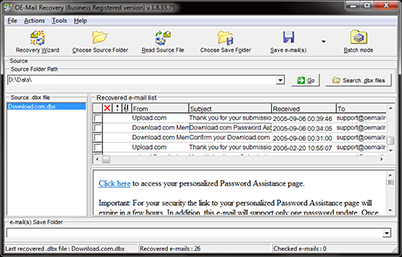 OE-Mail Recovery is an email recovery tool which was developed to recover email from Outlook Express corrupt dbx files. The software recover Outlook Express empty folders. OE-Mail Recovery is a data recovery and dbx read solution for corrupt Outlook Express folders. OE-Mail Recover software is easy to use with no special user knowledge or skills required for a recovering Outlook Express corrupt folders. This useful tool will help you to keep all your documents in Outlook Express safe. Outlook Express email program became the most widely used program for email communication in the world and accidentally losing or deleting an important message can be one of the worst experiences you or your company ever suffered from. Outlook Express email disappear resolver allows you to recover your lost or deleted email messages from corrupt Outlook Express folders quickly and easily. OE-Mail Recovery software is an easy solution to extract email from Outlook Express crashed dbx files and the easiest way for dbx read experience. If you can't open Outlook Express crash files or you have troubles when working with dbx files or when viewing dbx files in corrupt Outlook Express folders - fix all you email problems with one affordable solution. Download our powerful Outlook Express problem solving software now! The first symptoms of Outlook Express corrupt dbx files usually are innocent and insensible. Simple tasks like marking a message as read or view mails might take several tens seconds. Such performance issues usually mean that some minor corruption of dbx files has occurred. Try to fix all errors in corrupt Outlook Express folders using new and efficient software - OE-Mail Recovery. This tool allows you quickly recover damaged dbx files, view dbx files and dbx read. Be insured in the situations of Outlook Express crash - download OE-Mail Recovery now! This user friendly and easy to use dbx read software will save your time, money and recover your important mails from corrupt Outlook Express folders in minutes! 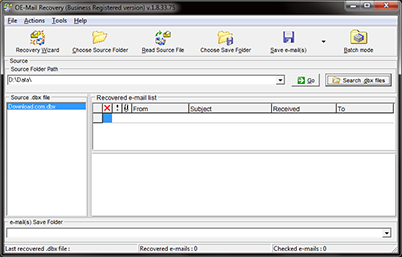 OE-Mail Recovery is Outlook Express email disappear resolver.